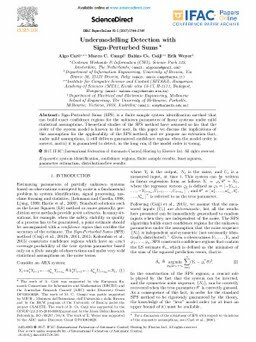 Sign-Perturbed Sums (SPS) is a finite sample system identification method that can build exact confidence regions for the unknown parameters of linear systems under mild statistical assumptions. Theoretical studies of the SPS method have assumed so far that the order of the system model is known to the user. In this paper we discuss the implications of this assumption for the applicability of the SPS method, and we propose an extension that, under mild assumptions, i) still delivers guaranteed confidence regions when the model order is correct, and ii) it is guaranteed to detect, in the long run, if the model order is wrong.